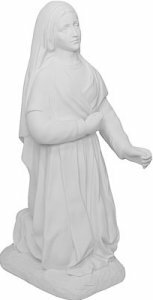 Composite marble Bernadette statue for indoor or outdoor use, suitable to make your own garden grotto. Or as a graveyard memorial or remembrance statue to reflect someone you loved. Or for a school or church.